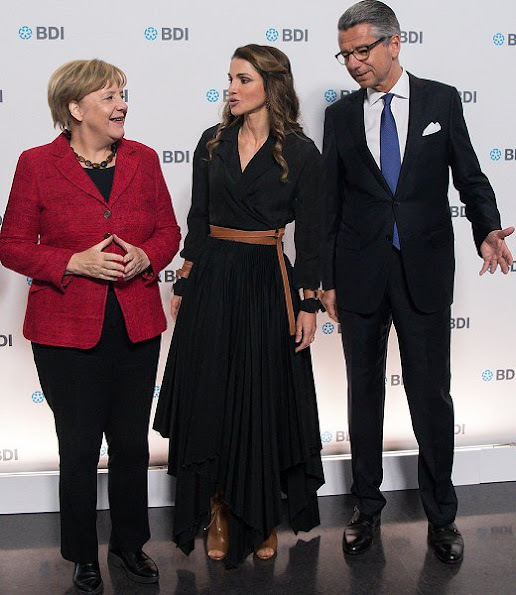 Queen Rania of Jordan attended the Day of German Industry 2016 conference organised by the Federation of German Industry (BDI) on October 6, 2016 in Berlin, Germany. Queen Rania is the guest of honour this year and spoke on Jordan's policies of accepting millions of Syrian refugees. Germany too is facing the integration of hundreds of thousands of refugees, many of them from Syria. Wow, both Angela and this Ulrich Grillo guy seem overly pleased with standing/sitting next to the queen. I bet Grillo on the second picture is just saying to Merkel "would you please shut up so that I can tell her my best pick up line?" This is a unique dress. Very Rania, very... intresting. Wow, this look is stunningly spectacular! If only the females who spend hard-earned money on clothing to reveal almost their entire bodies could see what a mostly-covered look can do. A dramatic design, confident and commanding stride. El vestido es original, pero las muñequeras de cuero y los botines abiertos son horrorosos. Lo siento, Rania. Absolutely love the dress, the hemline is gorgeous, however the Queen's footwear in my opinion is spoiling the the look. A simple plain stiletto would have looked elegant.